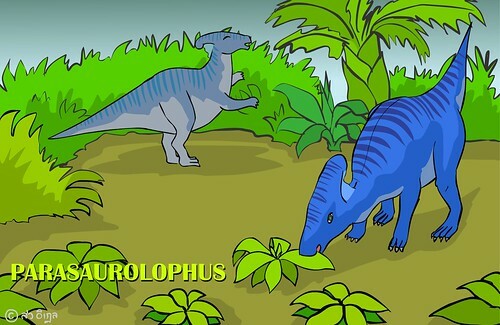 Parasaurolophus is famous because of its strange head and flat chest which is rarely found in other dinosaurs. Parasaurolophus’s arms are big enough to help its legs carrying the body, so we are not sure if it is 4-legged or 2-legged. Roll mouse over the small dinosaur, you will see how it stands with 2 legs.